By now most people will hopefully realise that the Olympic Games are coming to London for the first time in over 60 years this summer. They certainly can not miss will if they live in London as the media focus has been continues to grow each day. I for one am looking forward to the games, especially as I have been fortunate to obtain tickets to watch two athletics sessions (my father is a former three-time Olympic athlete) and two of the quarter-final basketball games. Consequently, I have found myself on the look-out for some nice autograph cards from NBA players who will compete for Great Britain (or Team GB as they are known locally) in the summer. First up is Ben Gordon, formerly of the Bulls and now of the Pistons. Although brought up in New York, Gordon qualifies for Great Britain by virtue of the fact that he was was born in London to Jamaican parents. 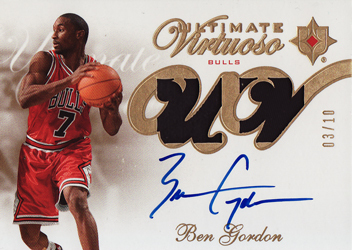 In 2008 I put together a complete set of the 2007-08 Ultimate Collection Virtuoso autograph set. The set consisted of 15 seperate cards, which were serial-numberd to 25 and featured a game-used patch and on-card autograph. 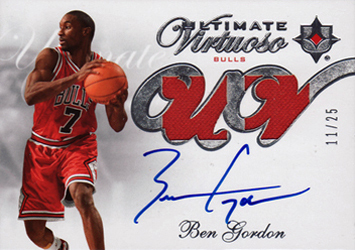 The Ben Gordon version of the card from that set is shown above. More recently, I came across an auction of the 'Gold' paralell version of this card. With the basic same design, but using gold as opposed to silver foil and featuring a slightly different colouring, the parallel cards were serial numbered to only 10. It seem churlish not to add this to the collection ahead of hopefully seeing Gordon suit up in my home countries colours at the years Olympic Games!